Master ASL! 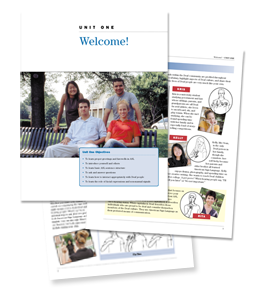 is an American Sign Language curriculum that supports the communicative competence approach to language learning and teaching. The Student Companion is a separate, soft-cover book focusing on developing fingerspelling, numbers, and glossing skills. This text is divided into 10 units that correspond to the units in the Student Textbook. Over 400 practice exercises, drills, and explanations to help students master these challenging skills. Special sections within each unit provide helpful hints for improving skills along with answers to frequently asked questions. A glossary provides information on important terms and concepts appearing in the Student Textbook. A vocabulary index includes the corresponding gloss for each vocabulary item appearing in Master ASL! The Student DVD is an essential component of the Master ASL! curriculum. The DVD is important to help students apply what they've learned in class to their homework and out-of-class practice exercises. It includes narratives for the student to view, memorize and repeat or record themselves performing. All the signs that are illustrated in the text are also presented in full motion on the Video Vocabulary portion of the DVD. Easy navigation to quickly move between units and topics in each unit. A variety of Deaf language models present ASL narratives, dialogues, and samples of ASL literature. Grammar and culture sections are introduced and explained with helpful examples. These sections are voiced over to allow students to learn and review independently. Examples of ASL literature include ABC and classifier stories, handshape rhymes, and number stories. Over 1,500 vocabulary signs, including regional sign variations and fingerspelled terms, from the Student Textbook are included to help students practice vocabulary out of class.